Assembling a piece of furniture is one of the secret joys of grown men. Period. No matter what they claim few things are as satisfying as putting together a modernistic new night stand with a million screws and pieces. It’s a sensation comparable to climbing mount Everest managing through those complicated instructions and looking at what is in a way a grown up LEGO for the 30 something male. However there are certain complications that stand between the average person and the indulgence of his manly childishness. And no – it’s not the instructions. It’s getting that huge wardrobe you bought at the store back home. Indeed a lot of the big furniture stores to offer delivery but often it is very expensive. Luckily there is an actual IKEA furniture delivery service (or any other garden and home accessories store) provided by outside contractors such as us. Our highly trained employees will pick up your purchase be it a sofa for your living room or a new bench for your garden and deliver it fast to your home. From a set of kitchen cabinets to a king sized bed we’ll deliver anything you want without risk of damage. Our service is not limited to purchased from IKEA – we’re ready to deliver items from all furniture and garden supply store in Liverpool such as Argos, Zen Furniture, Socktons, etc. We’re also prepared to help you out with furniture assembling or disassembling. Some people do not have the time or the patience to deal with piecing together a big wardrobe. Our experienced professionals are ready to help you with that problem and can quickly put together or dismantle any piece of furniture you require saving you time and energy you can invest at work or spend with your family. We guarantee that we can disassemble, move and assemble again any piece of furniture and leave it looking as if it was never moved. 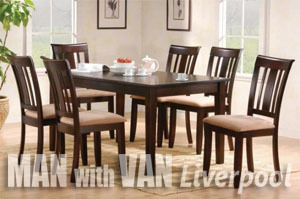 Naturally we do not limit our services to delivering furniture in Liverpool. We’re equipped and prepared to offer you our construction materials delivery services. Almost any construction material can be brought to you fast and professionally. Bricks, bags of cement, boxes of paint – you can trust us to get them to you from the store very quick and without having to worry about transportation damage. Plan where to build that gazebo in your garden you always wanted and leave the logistics delivering the construction materials to us. The pricing of the entire range of services we offer is fair. It might not be the cheapest out there but it’s definitely the lowest you have to pay if you don’t want to make any compromise with quality of service. Highly trained, highly professional, dedicated to the customer satisfaction, our employees are there to work for you. With services ranging from furniture from IKEA collection and delivery, through building material delivery to furniture assemble/disassemble, our company is the go to place for all your furniture delivery need in Liverpool.